The Tulsa Area United Way's Women United is sponsoring a series of events hosted by our community's top business leaders, volunteers and Women United members. If you give through your company campaign, we may not have your individual donor information. We would like the opportunity to thank you and share with you the impact your contribution makes in our community. Join other Women United Patron donors ($1,000 and above) for drinks and appetizers with Dr. Deborah Gist, the superintendent of Tulsa Public Schools. Dr. Gist will discuss self-care and success as she's come to understand it over her years as a leader in education administration. As commissioner of the Rhode Island Department of Elementary and Secondary Education, Deborah Gist created an evaluation model to help teachers continuously improve their instructional practices and established a system to track student performance so no student fell through the proverbial cracks. Thanks to these efforts and more, Rhode Island’s students outperformed the national average in math and reading for the first time ever. She now serves as superintendent in her hometown district, Tulsa Public Schools, where she works every day to support great teachers and drive student learning. The event location address will be sent out to attendees. Registration is on a first-come-first-served basis. More details will be provided with reservation confirmation. For questions about registration, please contact womenunited@tauw.org or call the Director of Donor Experience, Heidi Braver, at (918) 295-6660. Women United Patron donors and Steering Committee members passed a pleasant evening with Alison Anthony, the President and CEO of Tulsa Area United Way, where she reflected on her first fundraising campaign with TAUW, her vision for the organization and how Women United can play a role in the United Way’s future success. Women United Patron donors enjoyed an intimate evening with Sunny Patel, Chief Executive Officer for 3S Hotels Group. Sunny shared her journey from Zambia to Tulsa – including careers in nursing, engineering and politics – as well as family traditions and recipes passed down for generations. Women United Patron donors enjoyed an intimate evening with Marcia MacLeod, recently retired Senior Vice President and Chief Human Resources Officer for WPX Energy, who gave valuable advice on cultivating your network at every phase of life. Women United Leadership Society donors enjoyed learning from Teresa Burkett and Lauren Brookey about how their long-term friendship furthered their commitment to our community. Attorney and former judge Deborah Shallcross hosted Women United members in her home for the latest Connecting Circle. Members enjoyed brunch and a fascinating discussion on the topic of how far women have come in regards to equality in the workplace. Attendees also discussed the work that still needs to be done in this important arena. Campaign Co-Chair, Marla Bradshaw, invited Women United members into her home for the a Connecting Circle event. Members enjoyed lunch and conversation on strong relationship building between partner agencies and volunteers. The Connecting Circle Series continued with an event at Lefty's on Greenwood hosted by co-founder of The Hille Foundation, Mary Ann Hille. Women United members enjoyed lunch with Mary Ann as well as discussions about the importance of women's involvement in philanthropy. Shiela Haynes, correspondent with the Tulsa World, invited Women United members into her home for a Connecting Circle event. A dozen Women United members enjoyed getting to know Shiela. They visited on the topic of the large impact volunteers can have in our community. 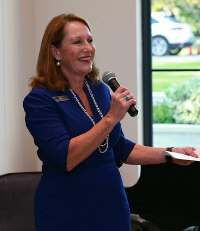 Betsy Jackson, shareholder with Hall Estill, hosted the Connecting Circle event at her home. Attendees enjoyed discussing how women can encourage each other to succeed instead of competing with each other. Everyone was having such a good time, we neglected to get a group photo, so we're showing off the delicious WU-themed cake balls everyone enjoyed. The Connecting Circle series continued at the home of Paula Huck, Director of Community Affairs for Blue Cross and Blue Shield of Oklahoma and Executive Director of the Oklahoma Caring Foundation. Attendees enjoyed discussing how to make time in their busy schedules to take care of themselves. Guests joined Becky Frank in her downtown Tulsa home for a relaxing, fun and informal visit. They enjoyed open discussion about a wide variety of topics including advancing a career, mentoring, growing a role in the community, and balancing personal and professional lives. The third event in the Connecting Circles series took place at the home of Robyn Ewing, Senior VP, Strategic Services, Administration and Chief Administrative Officer, Williams. Seven attendees enjoyed discussing the book, Women Don't Ask: The High Cost of Avoiding Negotiation and Positive Strategies for Change. The second event in the Connecting Circles series took place at the home of Alison Anthony, President Williams Foundation and Director Strategic Outreach, Williams. Nine attendees enjoyed a relaxed and fun time around the pool with Alison discussing succeeding and staying true to oneself in the workplace. The Connecting Circles series kicked off with 10 attendees in the home of Caron Lawhorn, senior vice president, commercial, ONE Gas. The women enjoyed a special time of mentoring advice, professional development and engaging conversation on the topic of getting outside their comfort zones.